Description: Sound off earbuds & splitter with case. This is the perfect travel accessory! This kit includes two sets of earbuds, a music splitter and EVA case. Allows two people to listen to the same audio device at the same time with their own set of earbuds. Can be used on smartphones, tablets and all music players with a 3,5 mm audio jack. Cable length: 110 mm. ABS plastic and EVA case. Features: Allows two people to listen to the same audio device at the same time with their own set of earbuds. 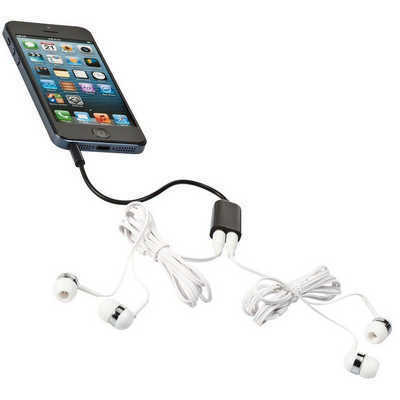 Can be used on smartphones, tablets and all music players with a 3,5 mm audio jack. Cable length: 110 cm. ABS plastic and EVA case. Packaging: Polybag. Colour: White Material: ABS plastic & EVA case Product Size: Case: 80mm(diameter) x 36mm(d). Freight details: 250 per carton, 12.5kgs, 41 x 40 x 46cms; Decoration Type(s): Colour Print / Full Colour Print / Print with Dome . Decoration Area: Screen - On case: 35mm(diameter) on case. See drop down menu for decoration options.